Poor Niamh, she’s been stuck at the bottom of that lake for so long. All that water has her bloated. She was such a slender thing, like a reed, remember, and the water has made her hair turn green and it waves in the current like algae. She stares up and all she can see day after day is an eternity of blue, sometimes the strong limbs of a swan, or the bottom of a boat, a fishing line dropping down, the small lead weight like a bullet shooting past her eyes. She’s stuck there and all she can see is blue but she can hear alright. She heard you screaming, and she heard Edel calling her name and her howls….and then she heard her own funeral, poor Gabriel’s wretched sobs, and when they said ashes to ashes and dust to dust she shuddered right there in the mud, and pulled so hard to get up and out. And then she heard your wedding, and the music her Billy, your husband, played for you. Did you know that all those songs were about her my darling? All this time he’s still been playing for Niamh. She’s his muse. She knows all this but all she can hear are the sounds of your life, Catriona, Edel is too far away for her, so it is you she hears. She heard your baby’s first cry of life and the fear inside you like a sword slashing the air around you. I stayed with her at first, down at the bottom of the lake but really it was too hard for me because I had greeted it, the water had long released me but Niamh fought against it, and now it would not let her go. You know like when you are stuck in brambles and if you panic it gets worse? So my darling, I am a free spirit, and it was Edel I went to first. Niamh was only a baby. Niamh was an angel. At least she had the voice and face of one. Ten years ago she mysteriously drowned in the local lake, while out with her two older sisters, Edel and Catriona, identical twins. Was it an accident? Or was there something darker lurking beneath the sky that bleak winter’s day? A struggle between three siblings for love and eternity? There is a woman in my dreams. Her name is Sara. And occasionally she speaks to me. Her words hang like crystals in my memory. And occasionally she balances the sun on a finger tip and spins it with her breath. There are no shadows for the light is the brightest it has ever been. And from the crystals, rainbows are born. My many pasts, my future. Black Virgin is based upon Mary Magdalene’s and her Egyptian maidservant, Sara’s exile from Egypt, in the years following the resurrection. They are put to sea in a boat with two other women, Mary Salome and Mary, Mother of James. 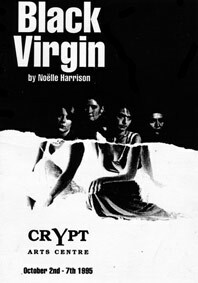 BLACK VIRGIN follows the journey of the four women from Egypt to their final destination, the Camargue in the south of France from whence springs the Cult of the Black Virgin. The women travel from the edge of despair, rejection and desolation to a sense of hope and belief in their own self and sensuality through the teaching and healing of Sara, who is transformed from servant to an image of a goddess. Northern Landscapes explores the thoughts and feelings of two young women, Gemma and Roz, struggling to achieve wholeness and integrity. The play follows their journey through different “landscapes” of experience from the shadow of a childhood darkened by abuse and its cold extremes towards the light of creativity and the affirmation of life. Music, slides and film accentuate the poetic narrative. The different media act as fragments from the subconscious of the characters, and at the same time lead you through the different landscapes of the play. 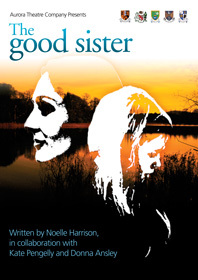 In Noelle Harrison ……we have found a passionate, poetic and distinctive new voice. Northern Landscapes….is an intriguing exploration of the damaged psyche of women brutalised by men who should have cherished them. Northern Landscapes is an important work that deserves a much wider audience.